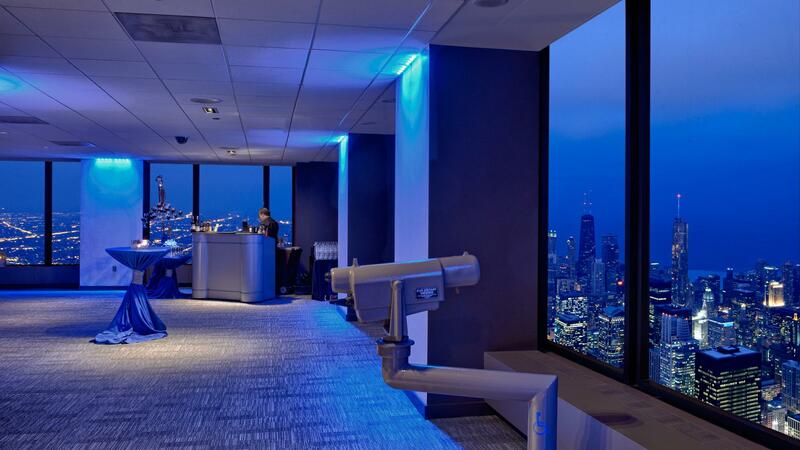 Rent Skydeck Chicago at Willis Tower | Corporate Events | Wedding Locations, Event Spaces and Party Venues. When planning your next Chicago private event or cocktail party, choose a space that is sure to make for an unforgettable experience—Willis Tower. is perfect for your next party, wedding reception, or event, offering the option for private VIP access to The Ledge, glass floor balconies extending four feet outside Willis Tower 1,353 feet over Chicago! The flexible venue space can be set up theater, classroom, or reception style and can seat 50-300 guests or even up to 400 guests for non-seated receptions. Our event coordinator will be available prior to and during the event to ensure the space meets your needs—so you can get back to enjoying the party. With nearby parking and flexible caterers, our space is perfect for your event. is sure to impress your guests—with a 360 degree view of Chicago, including panoramic views of the lakefront and up to four states. Willis Tower, the tallest building in the Western Hemisphere and a world famous architectural icon, stands 1,450 feet tall and 110 stories in the heart of downtown Chicago. Choose the venue that makes an impression—Willis Tower. The Skydeck is also available for business meetings or corporate events where a unique, memorable setting is desired. The venue is sure to inspire your group to think big.